Since measurements began in 1895, Alaska’s Hubbard Glacier has been thickening and steadily advancing into Disenchantment Bay. The advance runs counter to so many thinning and retreating glaciers nearby in Alaska and around the world. ...the current rate of glacier melt is without precedence at global scale, at least for the time period observed and probably also for recorded history, as indicated also in reconstructions from written and illustrated documents. In addition, the study shows that the long-term retreat of glacier tongues is a global phenomenon. Fig. 6. Global front variation observations from 1535 to 2010. (a) Qualitative summary of cumulative mean annual front variations. The colours range from dark blue for maximum extents (+2.5 km) to dark red for minimum extents (–1.6 km) relative to the extent in 1950 as a common reference (i.e. 0 km in white). (b) Qualitative summary of the ratio of advancing glaciers. The colours range from white for years with no reported advances to dark blue for years with a large ratio of advancing glaciers (192 of 3138 records >50%). Periods with very small data samples (n < 6) are masked in dark grey. The figure is based on all available front variation observations and reconstructions, excluding absolute annual front variations larger than 210ma–1 to reduce effects of calving and surging glaciers. Source: WGMS (2012, and earlier issues). In the top chart, notice how it gets progressively redder, showing how most glaciers are now retreating. In the bottom chart it shows the ratio of advancing glaciers. White represents years with no reported advances. So Anthony got it wrong, again. No surprises there. 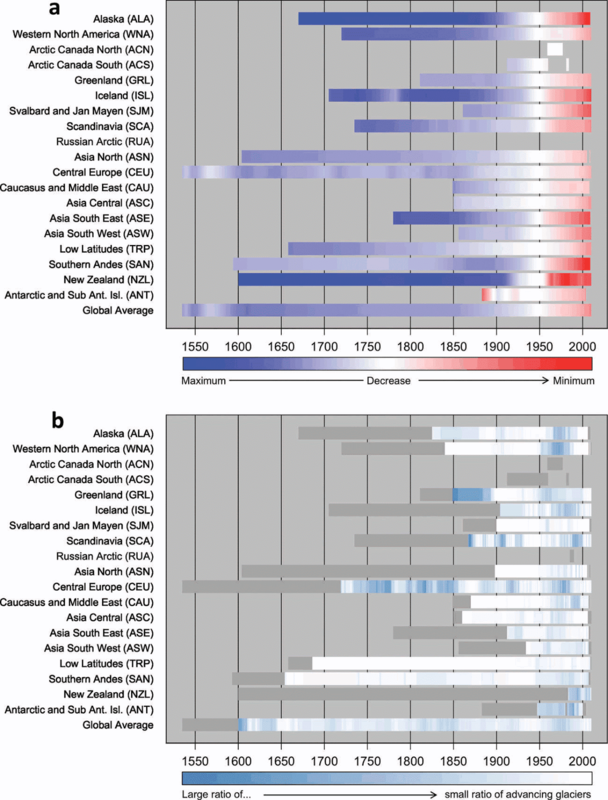 Intermittent re‐advance periods at regional and decadal scales are normally restricted to a subsample of glaciers and have not come close to achieving the Little Ice Age maximum positions reached between the 16th and 19th century. As such, glacier tongues in Norway have retreated by some kilometres from its maximum extents in the 19th century. The intermittent re-advances of the 1990s were restricted to glaciers in the coastal area and to a few hundred metres. As the authors state, there are about 47 000 observations available from 2300 glaciers around the world. Some of the observations go way back as far as the 1500s. Below is Table 1 from the report, showing the number of observations, the time period covered, the average length of record and the area covered and more. There is a global trend to centennial glacier retreat from LIA maximum positions, with typical cumulative values of several hundred to a few thousand metres. In various mountain ranges, glaciers with decadal response times have shown intermittent readvances which, however, were short and thus much less extensive when compared to the overall frontal retreat. The most recent readvance phases were reported from Scandinavia and New Zealand in the 1990s. The worldwide retreat of glaciers is probably the most prominent icon of global climate change. The causality of global warming and melting ice is obvious and well understood, at least in principle, by the general public. In detail, the link between regional climatic forcing and glacier front variation is complicated by topographic factors (e.g. glacier hypsometry, slope, aspect) and resulting reaction and response times (cf. Jóhannesson and others, 1989), which can result in completely different reactions of neighbouring glaciers (Kuhn and others, 1985). 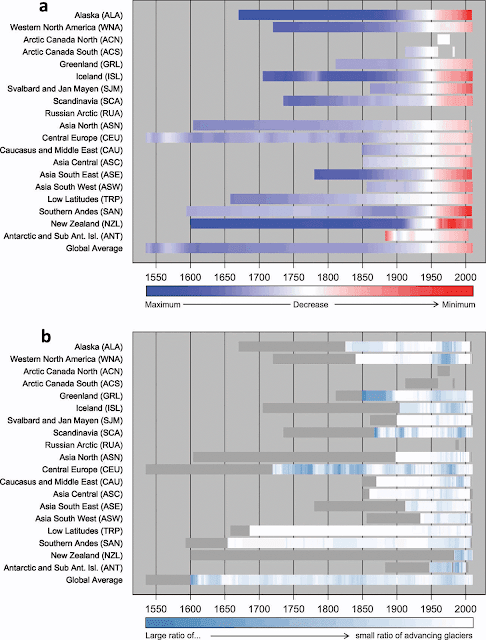 In this regard it is noteworthy that the global glacier sample shows a largely homogeneous retreat both at the centennial timescale and also over the past few decades. This homogeneous change in a sample covering a wide range of response times is also strong evidence that these changes are not the results of random variability but of globally consistent climatic forcing. What's obvious to most isn't obvious to hard-core deniers, is it. Is glacier monitoring no longer a priority? The amount of information available is much smaller when analysing the coverage from observations carried out in the 21st century (cf. WGMS, 2008a, table 4.1 and figs 4.6 and 4.7; Zemp and others, 2009). A large number of observation series have been discontinued, especially in North America and Asia. The loss of in situ front variation programmes could be compensated for to some extent by the use of remotesensing data (Hall and others, 2003; Machguth and Huss, 2014). However, corresponding studies over larger areas have not yet been carried out or reported in a systematic way. Deniers will probably be happy with that. Many of them would like to see all earth system studies shut down. That way they could pretend that we aren't doing anything to harm the planet. It's not all bad news. Europe and South America are reported to have good monitoring programs. Still, you'd think that Asia and North America would want to know what's happening, wouldn't you. BS or not the trick here is that scientist say gletjers are melting so it must be tru. We can not argue whit this one because they already believe those scientist saying so. John V. Wright isn't afraid of authority figures, though he'll take a fake authority over a real one. That's typical of RWA's by the way. It's also the No. 1 Telltale Technique of Climate Science Denial. Oh my word, wait until the noble Lord Monckton sees this! I had the pleasure of seeing Christopher Monckton fielding a question as to “why are all the world’s glaciers melting?” at a lecture at Keele University in Staffordshire, UK, about three years ago. Without looking at notes he crushed his hapless, youthful, warmist inquisitor under a tonnage of referenced scientific papers (with dates and names of leading researchers) which showed emphatically that most glaciers were not melting. Glaciers melting at "unprecedented" rate - currently the top-billed item on CBS news (archived for posterity). 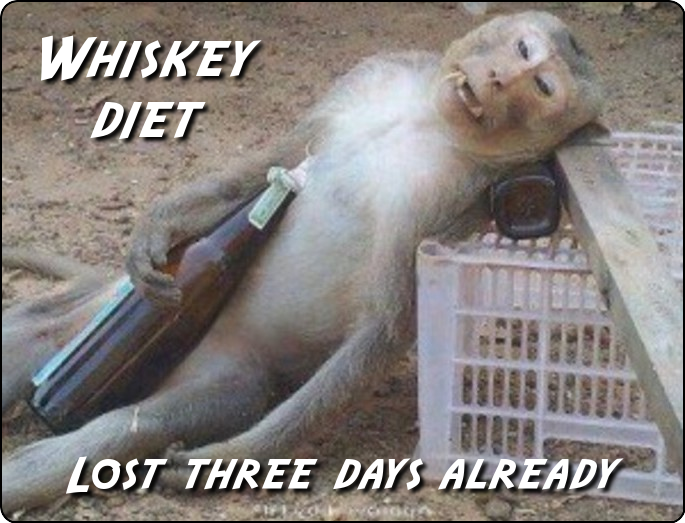 Well maybe he's been real busy with trying to lose some weight this summer. Maybe get a little porky over the winter. "Without looking at notes he crushed his hapless, youthful, warmist inquisitor under a tonnage of referenced scientific papers (with dates and names of leading researchers) which showed emphatically that most glaciers were not melting." What a pity his Lordship is unable to repeat the feat under conditions where a hapless, youthful, warmist inquisitor would have the opportunity to check his Lordship's 'facts'. It is easy enough, I went to the WGMS website and counted. Maybe Tony could do that too. Nice article! You've covered it well. Thanks! "Anyone who points to a single advancing glacier to try to argue global warming isn't happening, would do well to take note of this section". You ARE assuming that basic reading and comprehension skills exist, correct? And that severe cases of cognitive dissonance aren't closing down the mind of the reader, right? And that a basic desire for truth and understanding is also a component of the individual? And that telling the truth, adhering to reality and having a willingness to admit to the facts, exists? I know a few deniers on a personal level for many years. They exhibit none of these basic attributes, living in an imaginary world deep in their paranoid minds. Facts, evidence and the scientific process of discovery and knowledge are insufficient to sway them from their paranoid delusions and superstitious "denial" religion. Connedspiracies grip their minds, actions and beliefs. They're quite unable to tell the truth from fiction, lacking the basic skills of identifying logical fallacies, conjecture and straw arguments from the real facts. Scientists are sub-humans with an alien agenda, seeking to overthrow the world with their "wild" claims of greenhouse gasses and rising sea levels and melting ice. The clowns over at WUWT exhibit all of these things. They've given themselves over to delusions, paranoia and utter idiocy. I like what you're doing here, but "winning" over their minds probably doesn't happen much. Denialism encompasses much more then just climate change topics, issues and facts, denial permeates the believer into thinking that only "they" are right about other critical topics too, such as how the world works, physics, the environment, government, politics, religion and even they're own "role" on the "grand stage of the world" and how they see themselves. Many are narcissistic. Others are so paranoid and fearful that they can't bring themselves to accept anything. The darkness that surrounds their minds and the understanding that they embrace about the world is unbelievably distorted when matched up with reality. That's why they so often embrace asinine connedspiracies and haunt truly dumb websites and refuse to examine their own belief system. It is clearly obvious that they prefer to remain deluded. There is also the safety in numbers issue too. The desire to hold mankind back and embrace a new "dark age" of suppressed knowledge grips their minds. They see themselves as champions (and even rulers) for a new era of human "rule" to come, one which they constantly champion - which would mean a rather horrible world for the rest of us. Think of the ISIS monstrosity trying to survive today and you get a basic idea of what they really want. If they had their way, the quest for knowledge, truth, balance and a respect for each other, the environment and the future of mankind would rest only in their "capable" hands. We can't let that happen, under any circumstances. What you're really fighting against (and doing a great job by the way) is truly huge, definitely a monumental and necessary task. I sometimes wonder whether any of those funding this sort of nonsense ever get even slightly embarrassed by it, or if they are ruthlessly focused on their ends. It's not warming, the ice isn't melting, sea level isn't rising... sad what money can buy. Sociopaths are not troubled by a conscience. In the scheme of things the funding directed to the rejectionist idiots is literally chump change from a larger pool of lobby money. The sociopaths pay peanuts for climate nonsense and they get winged monkeys, and they probably don't spend a whole lot of time thinking about it....it's just one little part of their 24 / 7 campaign to climb over everything and everyone..